NS6 Series couplings were built on the Colder's proven platform of non-spill valves designed to provide fast, safe and virtually leak-free fluid line connections. 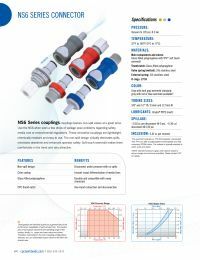 NS6 is an easy, twist-to-connect coupling with an integrated locking mechanism and double-sided non-spill shutoff valves. The NS6 is also chemically resistant making it ideal for a diverse range of applications.